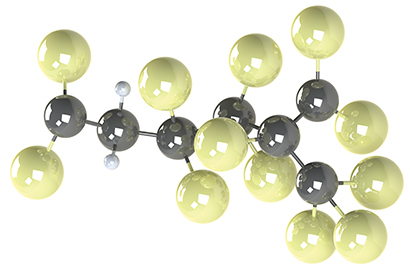 FKM (also known as FPM in Europe) rubber compounds are frequently used to resist extreme temperatures and harsh chemicals. The strong carbon-fluorine bonds that make up the polymer structure provide high thermo-chemical resistance, giving excellent ageing characteristics, such aslow compression set at elevated temperatures. FKM offers excellent resistance to mineral oils and greases, aliphatic, aromatic and some chlorinated hydrocarbons, fuels, silicone oils and greases. However, FKMs shows poor resistance to bases. Fluorocarbon rubber compounds are available as a copolymer (two monomers), terpolymer (three monomers) or as a tetrapolymer (four monomers). Each type determines both fluorine content and chemical structure which in turn significantly impact the chemical resistance and temperature performance of the polymer. More recent innovations include the development of FKM materials for use in low temperature applications, where with a glass transition of -40°C, it is possible to use FKM down to -51°C in service. Specific grades are also available for use in biofuels, e.g. ethanol or bio-diesel.